On Thursday the 7th and Thursday the 14th of July we will be holding Open Days at TAD&apos;s office and workshop full of fun activities for the whole family. Join us at TAD’s Northmead office and workshop during the school holidays! 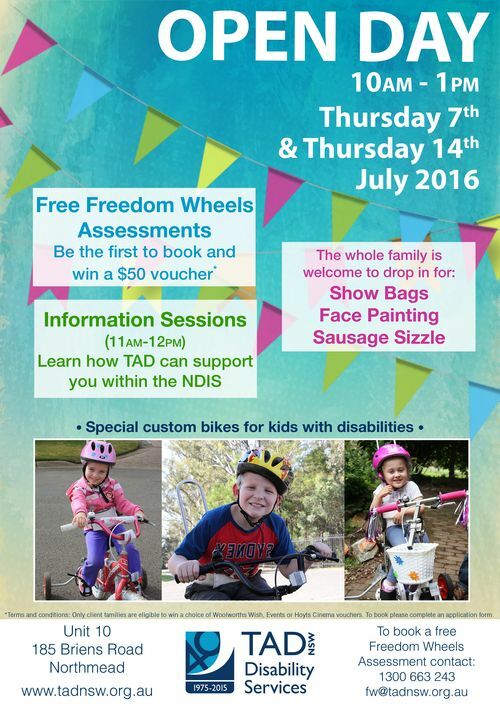 Free Freedom Wheels assessments will run throughout the day as well as an information session for families and service providers, where you can learn about TAD, our services and how we will be operating within the NDIS. Meet some of our staff and volunteers, find out about the unique equipment solutions we deliver. Everyone is welcome to drop in for show bags, balloons, face painting and a sausage sizzle even if you can&apos;t stay for the information session. Spaces are filling fast so contact Lexie today to book a Freedom Wheels assessment or RSVP for the information session on 1300 663 243 or fw@tadnsw.org.au.